The infamous Bob Maggio will be presenting K2 blackpearl debugging and troubleshooting on January 13, 11am-1pm central time. Information to attend remotely is below! Phillip Knight from Merit Energy will be hosting the K2 user group meetings at Merit Energy, located at 13727 Noel Road, Fourth Floor Rodessa Conference room, Tower 2, Dallas, Texas 75240. Parking information is included in the linked map below. Remote attendance information is included at the bottom of this message. PLEASE NOTE: Conference room has changed for this meeting. Link to map: http://www.meritenergy.com/content/MeritMap.pdf. Reminder: Merit Energy is on the 5th floor, but the meeting will be held in a 2nd floor conference room. Once off the elevator, go to the reception area and we will bring you back to the conference room. whether you are attending via live meeting or if you will be attending in person (so that we can plan for the number of people to order food for). Check out the K2 Underground site and our user group at http://k2underground.com/k2/InterestGroupHome.aspx?IntGroupID=11. We are posting webexes/live meetings from our meetings at this site. The Announcements section of the meeting will include any information regarding K2 upcoming events and user group events as well as brief introductions of our presenter and refreshment provider. The Tips & Tricks Presentation is when we as members can pose questions to each other on projects that we are working on and having difficulty with. It is also a time when if we have learned something that we feel will be helpful to others, we can share it with the group. Bring yours to share/ask. 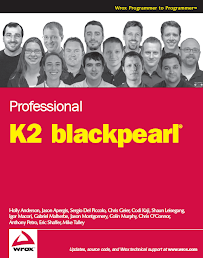 Bob Maggio from K2 will be presenting on debugging and troubleshooting techniques in K2 BlackPearl. This will be a great presentation for those of us who are new to K2 BlackPearl development and those of us that are just new to K2 BlackPearl. K2 blackpoint, a subset of K2 blackpearl features, provides unparalleled capabilities and affordability. It also offers an upgrade path so that organizations can grow their investment and add complexity over time, if needed. For more information, go to http://www.blackpoint.k2.com. The K2 platform is for delivering process-driven applications that improve business efficiency. Visual tools make it easy for anyone to assemble reusable objects into applications that use workflow and line-of-business information. For more information, contact Joe Bocardo at joeb@k2.com. Bob Maggio lives in Fort Mill, SC and has been part of the North American K2 Professional Services team since 2005. Before K2 he was a member of various production and application development teams focusing on implementation of Microsoft technologies. Note: please keep your phone on mute until you are ready to speak.